JJ Loughran gets local manufacturer operational in under 2 hours. 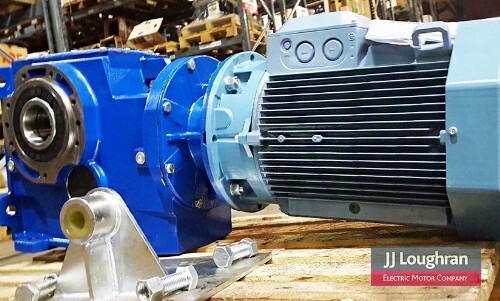 A local manufactured contacted JJ Loughran to tell them that their existing gearbox had failed onsite and they didn’t have a spare, JJ Loughran were able to build from stock a replacement Motovario 50mm bore gearbox complete with a high efficiency ABB 11KW IE3 Electric Motor in under 2 hours. Our customer had contacted the original German gearbox supplier who quoted 4 working weeks for a replacement. JJ Loughran was able to replace the unit with a Motovario gearbox directly as it shared the same footprint as the original design, this ensured minimum downtime when the new unit was fitted onsite, we were even able to offer a higher service factor than the original units design. Due to the urgency of the situation our customer asked JJ Loughran site engineers to assist their own maintenance team in the electrical and mechanical installation of the gearbox on site. Once we got the system operational , we noted that due to the new processes on site the original unit could benefit greatly from a Vacon variable speed drive being fitted, the customer had no room inside their original control panel but we were able to mount a new 11KW Danfoss Vacon variable speed drive 100X IP66 which is fully waterproof and makes the drive suitable for use in harsh environments. It can be placed onto the motor or as close to the motor equipment as possible. This makes it ideal for retrofitting, in any external applications or machinery that is subject to regular wash-downs. Cabinets, shielded cabling and electrical rooms are unnecessary. The large cooling ribs on the front of the drive enclosure provide cooling without collecting dust. They allow full access to the heatsink and can be cleaned with pressurized water making them easy to maintain and ensuring reliable operation. JJ Loughran was also able to provide a 2 year warranty on the complete solution.